When you can spend 5 days having fun, improving your patience, and filling the freezer – you know you had a great week!! Well we were offered a chance to do a bit of hunting this past week at a friend’s house. So we grabbed this great chance and spent many hours in deer stands hoping to spy some deer or hogs. 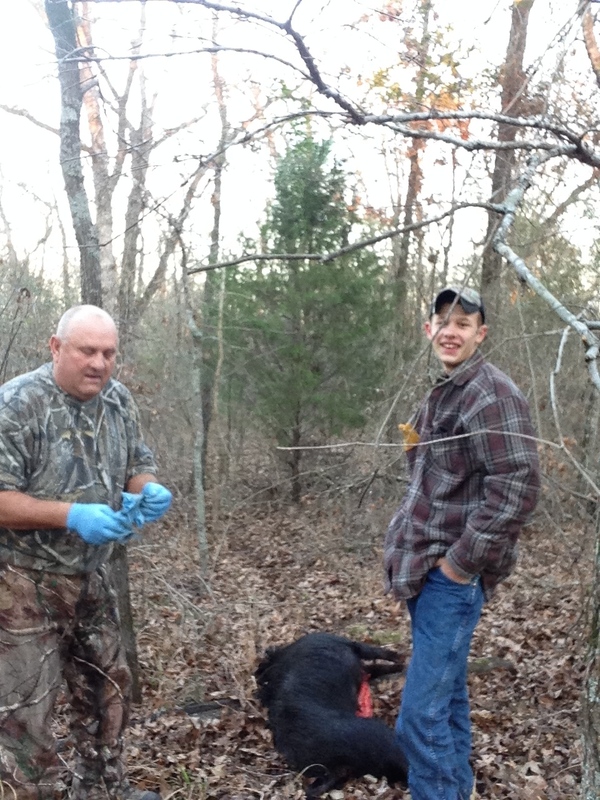 J was thrilled to harvest a 200lb sow (female hog) and P shot a doe. So our freezer is overflowing now! We made our first batch of breakfast sausage (10lb) and Italian sausage (5lb). We also have lots of chili meat! So on top of a full freezer, I think my favorite part of the week is that my boys actually love to hunt. They had a sweetheart year their first year hunting. They harvested does at every hunt, often more than one. This year has been different though. E hunted with Robert and only came home with a hog, P went on a weekend hunt and he did not see an animal. While I know this is normal, I was afraid that my boys were going to lose their interest in hunting once they realized that much of the time is waiting. After spending many mornings and afternoons sitting still, being quiet, and watching for animals, my kids were begging to go back the next day. Today we spent the day discussing all we need to do before going on our next youth hunt – and this is after a week of hunting. So I think it is official. My boys love to hunt, whether they harvest an animal or not. And I love it – I love that they want to be in a deer blind, that they love to watch the squirrels and birds even if the deer do not come out. All the while they are learning self control, they have to be quiet in the blind. They are working on patience as they wait, and wait and wait and sometimes never see a deer. I love that they love hunting – and that they are happy to fill my freezer! Each boy even helped process the hog and deer this afternoon! It is a win-win for me! !